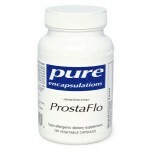 Flower pollen extract contained in ProstaFlo offers concentrated support for urinary and prostate health. Gentlemen's 3? is a unique combination of the world?s most powerful and beneficial herbs for men.